Abu Dhabi: Wild cheetahs have made a comeback to the UAE, with four cubs born on Sir Bani Yas Island, thanks to a successful breeding and conservation programme. Declared extinct in the UAE in 1972, cheetahs have been classified globally as species vulnerable to extinction by the IUCN (International Union for Conservation of Nature), who monitors the status of nature and wildlife worldwide. With less than 10,000 wild cheetahs left in the world, the births of the cubs are of particular significance globally and locally, officials said yesterday, announcing the arrival of the cubs. Spanning over 87 square kilometres the natural island Sir Bani Yas is located 250 kilometres from Abu Dhabi. The island is one amongst the eight natural islands that form the Desert Islands destination, developed by Tourism Development and Investment Company (TDIC). The cubs were born to captive-bred parents, brought to the island as part of TDIC's conservation efforts which include — breeding, re-wilding, releasing into the Arabian Wildlife Park to become an integral part of the natural population control for hoofed species on the island. 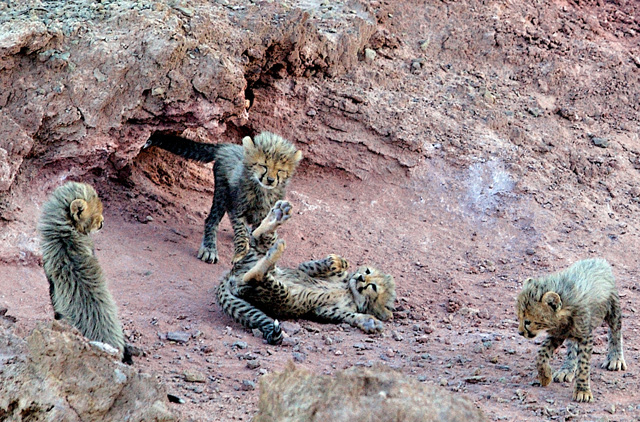 The cubs are another feather in the cap for the programme, which saw the birth of the first hyena cubs in the wild in the UAE, earlier this year. "It's a great achievement... we are very excited," Marius Prinsloo, Manager of Conservation and Agriculture at the island, told Gulf News. A 40-member conservation team under Prinsloo puts animals on an intensive re-wilding programme, to ensure they can hunt and be self-sufficient before they are released into the park. "Re-wilding is complicated and tedious. Its success [is] on utilising the natural instincts of the animals," he said. This ensures the animals' natural prey is available, they are fit to hunt. Visitors will soon be able to see the mother and her cubs venturing into the 4,100-hectare Park, home to more than 7,500 animals. Cheetahs are a member of the cat family and are well-known for being the fastest terrestrial mammal able to reach speeds of 112-120 km/h. 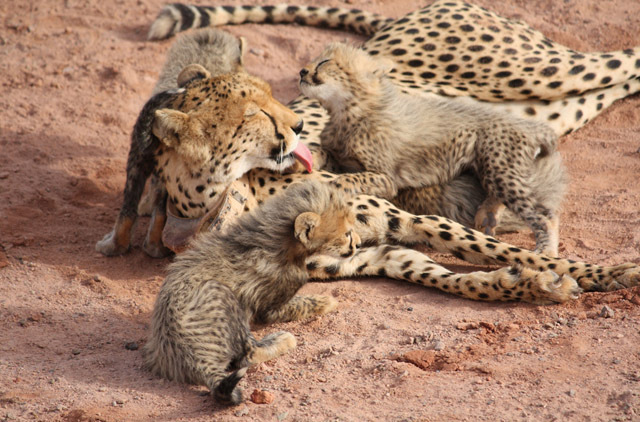 There are five different subspecies of cheetah worldwide; the cheetahs on Sir Bani Yas Island are of the Northern Cheetah (Acinonyx jubatus soemmeringii) subspecies. They help to restore a ‘natural' ecosystem of predators and prey.